This dog food review has been sent in to us by Cheryl Dean and relates to her experience with Fish4Dogs Working Dog Complete. I feed tripe and veg am with Fish4Dogs and some veg/meat scraps PM. They are full of life and look great, firm stools etc. It's more costly but I feed less. 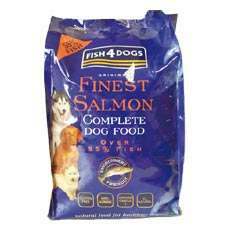 I switched to Fish4Dogs dog food as the previous kibble I was feeding contained poor amounts of meat or fish. White fish contains high levels of Omega 3, which aids with coat and skin health and joint mobility. Contains over 55% fish plus vitamins and minerals for a complete daily diet for healthy dogs meeting the different life-stage requirements of all dogs from junior dogs through to adult and onto senior dogs. Contains fish and potato, two food types that are unlikely to cause dietary hypersensitivity. It is well suited to dogs with specific nutritional profiles including a calorie controlled diet.